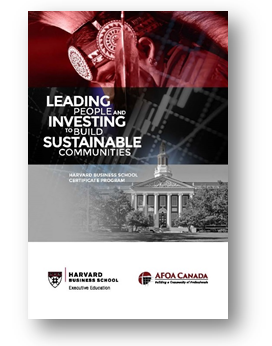 AFOA Canada is pleased to partner with the Harvard Business School to offer a program for Senior Administrators, Executive Officers, Elected Leaders and Senior Managers working in Aboriginal communities and organizations on-reserve, off-reserve and in urban, rural and isolated settings across Canada. Investment Governance – Participants will better understand investments and good governance practices over investments. Entrepreneurial Finance – Participants will build a framework and develop a better understanding for the valuation of potential investments, specifically pre-revenue start-ups. Negotiations – Participants will enhance their negotiating skills and develop negotiation strategies at an individual and team level. Change Management – Participants will develop effective strategies for leading through change at both an organizational and community level. PROGRAM TIMES: 1pm Monday May 1, 2017 to 12pm Friday May 5, 2017. In general, program sessions held daily from 8am to 6pm. TO APPLY: Please see full application form or contact Jody Anderson at AFOA Canada at 1-866-722-2362 or visit www.afoa.ca Participation is limited and seats fill quickly. CLICK HERE to download the application and to review requirements. Applications MUST be received by Friday, March 10th, 2017. Payment in full must be received by April 2, 2017. Minimum of half the payment must accompany application.